Illinois has by far the greatest number of local governments in the nation at 6,963, according to the U.S. Census Bureau’s 2012 Census of Governments. The vast number of local governments in Illinois is often cited as a driving factor for Illinois’ high property tax rate, one of the highest in the nation, as many of the local governments are primarily funded by property taxes. A large share of these local governments consist of local school districts, which in turn typically make up the largest share of a property owner’s tax bill. While the Illinois General Assembly recently passed and Governor Bruce Rauner signed into law legislation revamping the State’s school funding formula, there was not much discussion on reducing the number of school districts in Illinois. You can read more about the new evidence-based school funding formula here. The U.S. Census Bureau’s 2012 Census of Governments reports a total of 905 school districts in Illinois. The Illinois State Board of Education reported a total of 866 school districts in the 2011-12 school year. For the purposes of this blog post, Civic Federation uses school district data sourced from the Illinois State Board of Education, unless otherwise noted. The chart below provides a comparison of the number of school systems in selected states across the nation, as reported by the U.S. Census Bureau. Illinois has the third highest Census-reported number of school systems in the nation with a total of 905. Only California and Texas have a slightly higher number of school systems than Illinois, but the population of those states is more than double that of Illinois. Midwest states with similar populations, such as Michigan and Ohio, both have more than 200 fewer school systems than Illinois. The chart below displays the number of school districts and the number of schools by grade level in the six county northeastern Illinois region. According to 2017 data available from the Illinois State Board of Education, there are a total of 852 individual school districts in Illinois. Of the 102 counties in Illinois, the six county northeastern region of Illinois contains a total of 292 school districts, or approximately 34% of the total number of school districts in Illinois. Cook County has a total of 147 school districts that oversee a total of 1,163 schools. It is important to note that the public schools in Chicago make up the lion’s share of the schools in Cook County with approximately 587 public and charter schools. The collar counties, which consist of DuPage, Lake, McHenry, Will and Kane counties contain a total of 145 school districts that govern the operations of 813 individual schools. Of the collar counties, DuPage and Lake County have the highest number of school districts and individual schools. Interestingly Lake and McHenry County have an average of 4.1 schools per district and at the other end of the spectrum Kane County has an average of 17.7 schools per district. The following chart summarizes the revenue sources generated to fund school districts in Illinois. The majority of public education funding is derived from local property taxes, making up 63% of local school district funding, on average. Other local funding, such as fees, compose 4.6% of funding. The remainder of school district funding comes from state and federal funding sources. 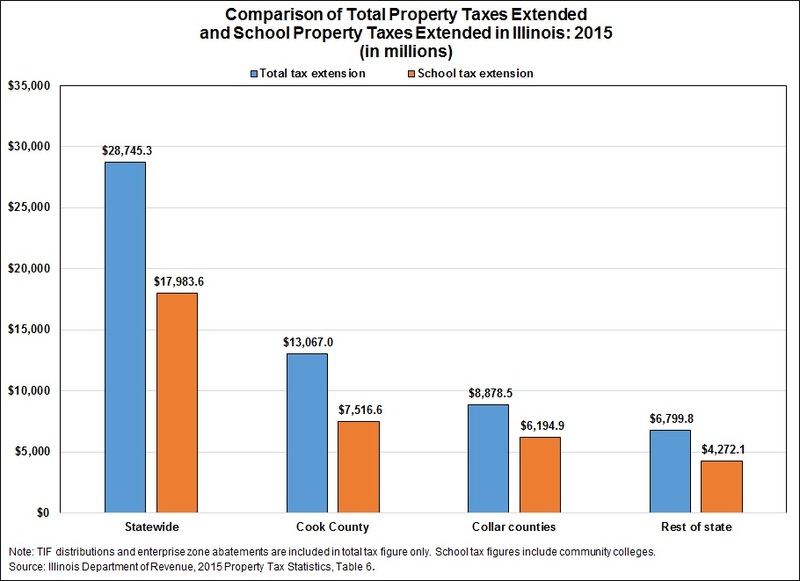 The next chart shows the total property taxes levied by all taxing bodies compared to total property taxes levied by schools statewide, in Cook County, the collar counties and the rest of the State. A total of $28.7 billion in property taxes were levied statewide in 2015. Of the $28.7 billion levied statewide, nearly $18.0 billion, or 62.6% went to fund school districts. In Cook County approximately 57.5% of property taxes levied go to fund public schools. In the collar counties nearly 70% of property taxes go to fund public schools. The following chart shows the change in the number school districts in Illinois since the 1983-84 school year, according to the Illinois State Board of Education. 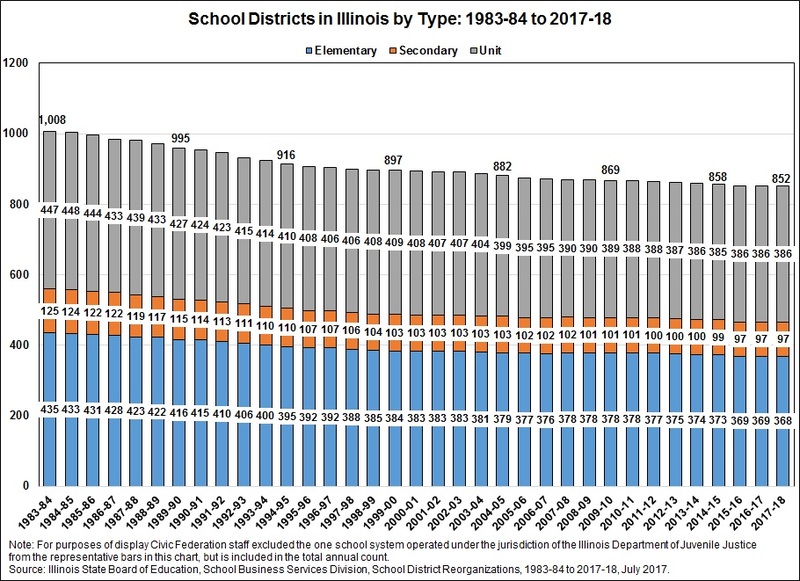 The total number of school districts in Illinois has decreased by 156, or 15.5%, from 1,008 school districts in 1983-84 to a total of 852 school districts in 2017-18. Elementary school districts have seen the largest reduction at 67 or 15.4%. Secondary education districts have seen the second largest percent decline at 22.4% or a total of 28 districts. Unit school districts have declined by a total of 13.6% or 61, from 447 districts to 386 districts. 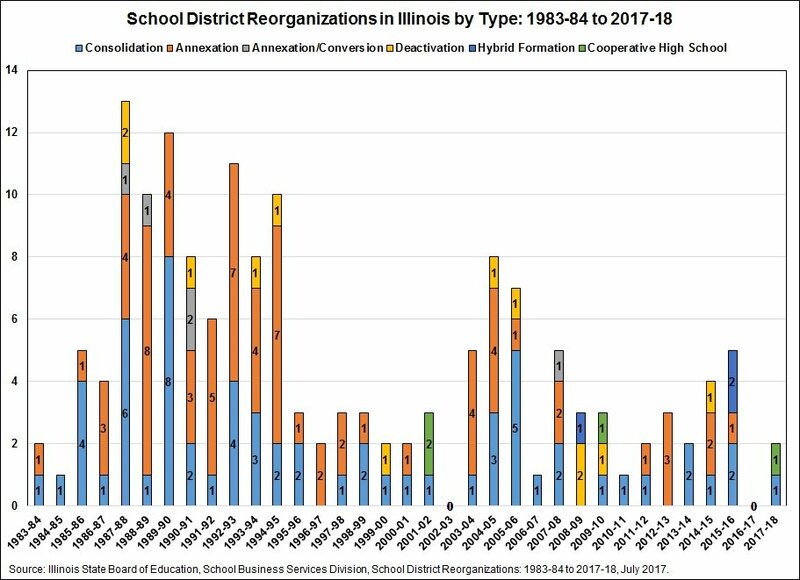 The graph below displays the number and type of school district reorganizations in Illinois since the 1983-84 school year. Since the 1983-84 school year there have been a total of 159 school district reorganizations. The majority of school district reorganizations were consolidations and annexations and occurred primarily between the late 1980s and early 1990s. There were no school district reorganizations during the 2002-03 and 2016-17 school years. Illinois Legislators, Governor Bruce Rauner and coalition groups such as Transform Illinois have made great strides in working to reduce barriers to local government consolidation efforts. To read more about recently passed legislation related to government consolidation and the multiplicity of local governments in Illinois see these Civic Federation blog posts here and here. While the consolidation efforts recently signed into law focus primarily on consolidation efforts at the township and county level of government, there has not been much discussion of school district consolidation in recent years. Local residents and State and local elected officials should now focus on sensible approaches, particularly the consolidation of one-school school districts, to reduce the number of school districts in Illinois, which may have a greater impact on reducing the administrative expenses related to operating so many school districts. You can learn more about the statutory procedures required for annexing, consolidating, or dissolving school districts and other local governments in Illinois by clicking here. While the number of school systems vary based on the reporting agency, the U.S. Census Bureau provides a good source for comparison across states. Illinois State Board of Education, Illinois Report Card: 2015-2016, https://www.illinoisreportcard.com/SearchResult.aspx?type=city&searchText=CHICAGO (last accessed October 4, 2017). 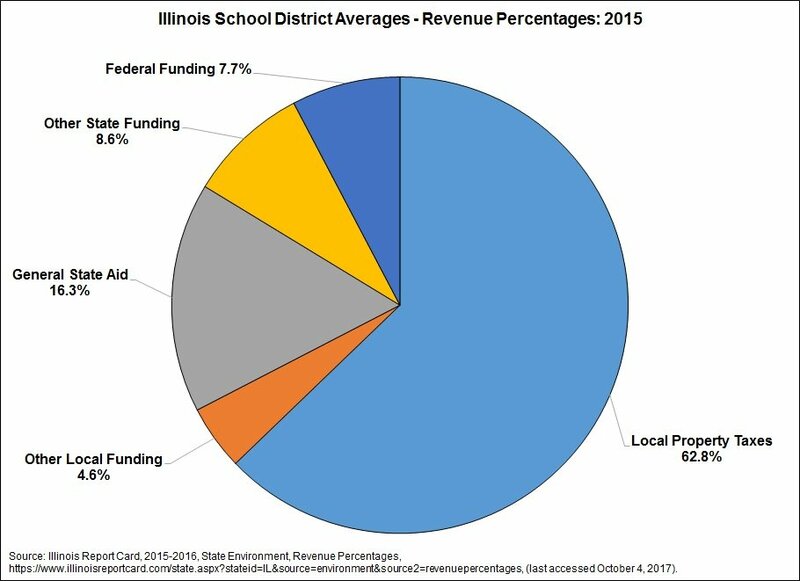 Illinois State Board of Education, Illinois Report Card: 2015-2016, State Environment, District Finances, Revenue Percentages, https://www.illinoisreportcard.com/state.aspx?stateid=IL&source=environment&source2=revenuepercentages (last accessed October 4, 2017).